Geneva – A focus on improved data will enable IOM to combat fake news and hate speech with solid facts and evidence, a UN meeting in Geneva heard today (22/3). A dedicated Europe section on the IOM Global Migration Data Analysis Centre website has just been launched, and it was presented today at a side event at the United Nations Economic Commission for Europe Regional Forum on Sustainable Development. An audience of politicians, diplomats and UN officials attending the UNECE Regional Forum on Sustainable Development heard that the portal highlights past and recent trends on migration in Europe, existing data sources, and strengths and weaknesses of those data. 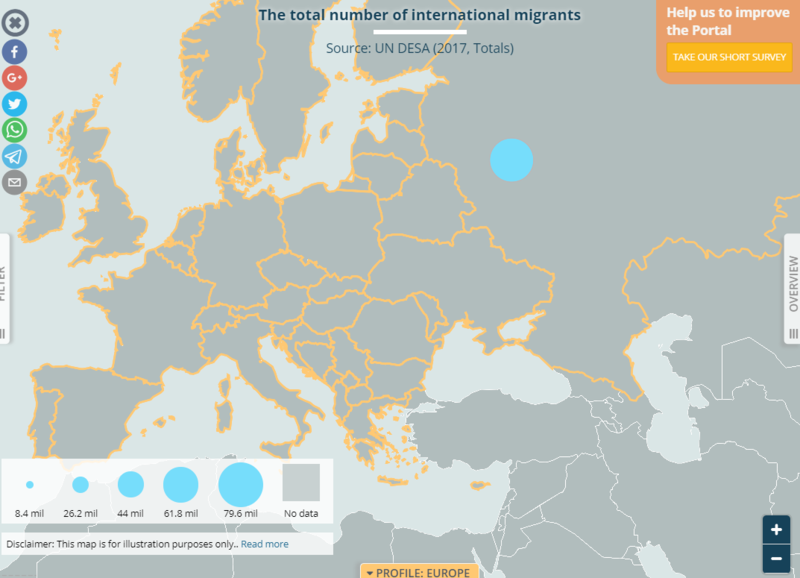 Part of IOM’s Global Migration Data Portal, launched in 2017, the new Europe section is designed to help policy makers, national statistics officers, journalists and the general public understand migration data. By making the evidence about migration issues accessible in one place and easy to understand, it contributes to a more informed public debate. The new Europe section was authored by the Knowledge Centre on Migration and Demography, a European Commission initiative to provide scientific evidence for EU policymaking in migration and demography related fields.